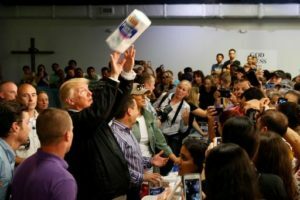 As the East Coast prepares to face the wrath of Hurricane Florence — predicted to be one of the most powerful storms to hit the United States in decades — President Trump decided it would be a good idea to publicly dispute reports that thousands of Puerto Ricans died as a result of Hurricane Maria in 2017. …Earlier this week, faced with the reports of the greatly expanded death toll, Trump insisted that he had done a terrific job in the country. “I actually think it was one of the best jobs that’s ever been with respect to what this is all about,” he told reporters. That was bad enough, particularly given the fact that a) we are talking about peoples’ lives here and b) another major hurricane was barreling toward the Carolinas even as Trump was touting his own performance after Hurricane Maria. Now Trump has gone even further — pivoting from merely defending his performance to embracing a conspiracy theory about the actual death toll from the hurricane and suggesting Democrats are secretly behind all of it. As evidence, he offers — you guessed it! — absolutely nothing. Trump’s ridiculous conspiracy theory isn’t just a political problem for the White House — it’s a serious albatross for Republicans in Colorado and across the country who have been embracing Trump ahead of the 2018 midterm election. Perfect timing, with the mid-terms now less than two months away. Lots of Puerto Ricans living in Florida now. In other, ‘Just Do It’ news: Nike’s stock closed at over $83, the highest ever in the company’s 54 year history.